Thorsten Heins, CEO of RIM, has been on a journey around various tech websites, keeping the conversation on BlackBerry. While we will not be seeing any BlackBerry 10 devices until early next year, Heins want to make sure people know why BlackBerry is still a top player. With the smartphone market maturing and most smartphones being able to do what BlackBerry’s were well known for back before the iPhone, RIM has had a hard job at keeping the BlackBerry relevant. Many businesses that issued out BlackBerry’s years ago for all employees are now turning to iPhone’s and Android phones. Where BlackBerry succeeded they are now being defeated by better smartphones – not only are their keypads and messaging services becoming degraded, they are becoming unpopular as touch screen interfaces get better and social media apps are added to apps stores. RIM does have a plan to stop this erosion of their service though, starting with their ‘Social Hub’. According to Heins, no other phone can as simply and as efficiently sort out all your social media into one place and still keep it organized from your work contacts and other areas. Instead of jumping into an email client app, then pulling out and going to Facebook, then pulling out of that app and going back into emails, you can use the Social Hub very simply. The Hub allows a user to aggregate all contacts from all different services to one place, and then decide which candidates go in personal folders and which go into work folders and so on. We can see that while RIM are losing their management and enterprise touch, they are convinced that this piece of software will be a winner for them. The Social Hub certainly seems appealing for those that tire with endless amounts of social and email apps, and want one simple place to add all data. BlackBerry 10 will launch on January 30 and RIM hope to have 100,000 apps at launch for the event, a rather optimistic level. 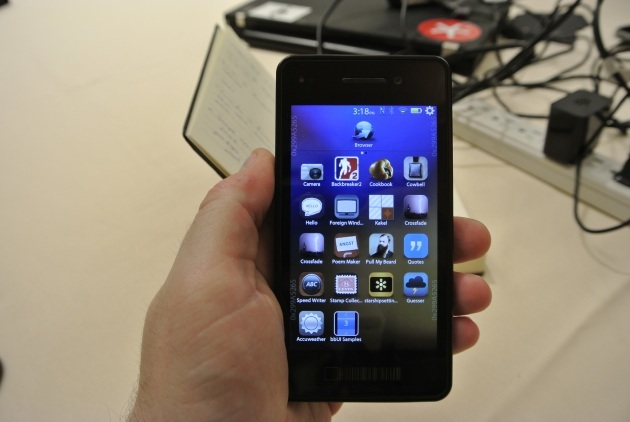 RIM want to target a “hyper-connected, multitasking, […] need to get things done” group of people, according to Heins interview withThe Verge. In his view, no smartphone provider influences this group now, and BlackBerry can. RIM is still a big brand, even though they have severely slumped in the past few years. They need good developers to keep on making apps for them and start getting content on their service. Even if they want to target enterprise, they should look to be a competitor on all fronts of the mobile computing industry if they truly want to succeed.